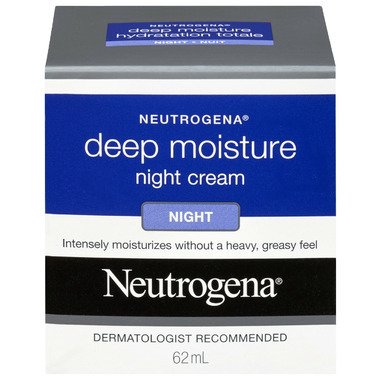 Neutrogena's Deep Moisture Night Cream has a fast-absorbing, non-comedogenic formula, with Vitamin D3 and Glycerin, that works deep within the skin's surface and over time helps boost skin's ability to replenish and hold onto moisture. Vitamin D3 helps balance skin's moisture levels while glycerin moisturizes deeply, instantly improving the look and feel of skin. Clinically proven to dramatically increase skin’s moisture level in just 1 week! Love the product. It softens my skin and keep hydrates all the day.. I ordered the day cream with spf 30. Will order it again.